The first sound you hear is a short sample of a “numbers station,” which are mysterious shortwave radio stations that are believed to be secretively operated by government agencies to communicate with spies out in the field. They have been around for several decades, all over the world, but never officially confirmed. The voice we hear intones “achtung” which indicates that it is German in origin. Perhaps this is a coded tribute to U2, whose early albums are an inspiration to this band? Even if it’s not, it’s a cool touch, and they use samples from those numbers stations throughout the album. From that brief introduction we go into the main portion of the opening song, “Eye,” which features a cool Pixies-like guitar riff. Lead guitarist and singer Brian Albano commanding that “I’m ready, I’m willing, I’m able – I’m ready to make the time” during the chorus. 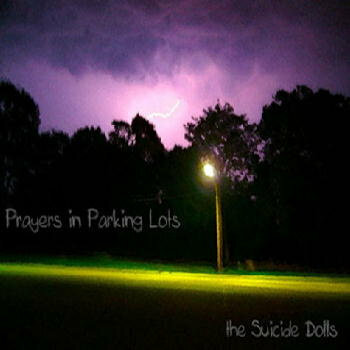 This might be the best song, out of many contenders, on what is The Suicide Dolls’ recently released debut album, Prayers in Parking Lots – an album that is extremely strong and accomplished. There are many Pixies-ish songs on this album, but traces of Sonic Youth can also be heard, and not just in the fact that, like Sonic Youth, The Suicide Dolls (great band name, by the way) are led by a singing couple – Albano and bassist/singer Michelle Montavon (they take turns singing lead) – who have been together since they were teenagers and have been playing in bands for many years but only now, finally, have released an album. By the recorded results, I say better late than never. Other influences heard throughout the album are The Jesus and Mary Chain, Joy Division and a bit of early Siouxsie and the Banshees. They don’t just ape these influences though – they take them and create memorable songs out of them. Michelle sounds a little bit like a subdued Courtney Love (now there’s a contradiction in terms) on “Shoo,” leading the band through a droning, yet intense number. Drummer Matt Covey and Michelle lock into an awesomely grinding groove, while Albano plays some great lead over the top. Impressive stuff. It’s hard to pick out individual songs due to the fact that they are all equally strong, intense and exciting – with dark overtones. They make angst-fueled music that doesn’t sound contrived and boring like a lot of what passes for alternative music these days. Throughout the album they bring back the best of late-80s/early-90s alternative rock, with a late-70s garage punk attack in certain spots. They also hint at some of the darker, trippier elements of neo-psychedelic shoegazing bands like My Bloody Valentine or early Boo Radleys – though in a very subtle way. I like how they are able to take well-worn sounds and make them new again. If Prayers had come out in the late 80s it definitely could have exploded all over college radio the way The Pixies and Sonic Youth did at the time. “Want” is another highlight, as well as “Drive” (this could have been as huge as any Breeders or Hole song in the 90s), with Covey bashing his drums in spectacular fashion, and the longer piece “Smash,” with a distorted-sounding Albano invoking Black Francis. He sings “I’ll do what I want – I’ll say what I want.” It then goes into some of Sonic Youth’s droning, experimental territory before returning to the main riff. The song “Elizabeth” has a great slowed-down trippy element to it, with a slight Velvet Underground feel mixed with early Public Image Ltd.
“Candy” is a nice mixture of late-period Black Flag (Albano sounding like a smoother and less intense Henry Rollins) with a sugar-pop rush to the backing vocals. “Brand New and Close By” reveals just how much of a Black Sabbath influence there was in bands like Nirvana, yet this really doesn’t sound like either band. Michelle’s voice sounds great on this song. The noisy, grinding “Deep Red” closes out the affair with both singers exchanging vocals to excellent effect and some of Albano’s most intense guitar playing of the album. It makes for a great ending. I was lucky enough to have discovered this band due to the fact that my father has been a lifelong friend of Montavon’s father, who gave me the album. Let’s hope everyone out there has their own luck in discovering this band, who are based out of New London, CT and have been playing together since 2002. They have just made a very impressive first album that is much too good to go unnoticed. Let’s hope this is only the beginning.